Several hundred rare and historical maps of the region are housed in Special Collections. These maps have been given careful treatment and are encapsulated for protection and extended use. They have been identified as a part of the Northeastern California Collection and as such, may be found on the online catalog. The catalog's advance search page allows you to limit your search to the material type "maps". The map collection includes Sanborn Fire Insurance maps, Official County maps and surveys. Reproductions of historical BLM platts and many other interesting and unique maps, charts, and atlases. View the Historical Map Collection here. 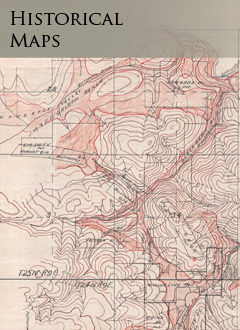 View the California Historical Topographic Map Collection here. View the Fire Insurance Map Collection here.